Time for Minimalist Mondays again! This week, we met at the Therapeutic Associates clinic/gym where Doc Sanatan works. The theme for this class was injury prevention, and it was a session I've been looking forward to taking. After all, my biggest reason for participating in Minimalist Mondays is to avoid more running injuries. We all gathered in a circle around Doc Ray and Doc Sanatan on the workout mats. Doc Ray started with a recap on the features of conventional shoes that lead to foot deformities and, subsequently, injury and pain. 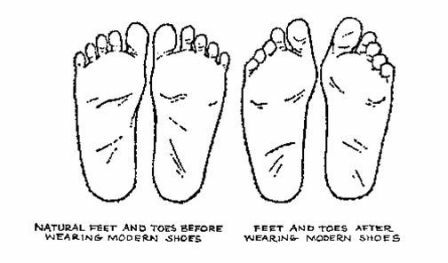 I don't think I'm capable of repeating all the medical terms and muscle names he used, but the gist of if it was this: elevated heels, arch supports, toe springs and tapered toe boxes mess up your feet. How do they mess up your feet? By collapsing your arches, by causing your toes to stay bent and scrunched together and by causing your big and little toes to bend inward, so that your foot is widest at the balls behind the toes. 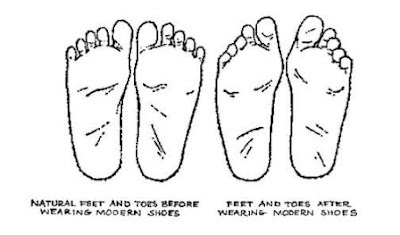 In cultures where people traditionally go barefoot or wear non-constricting shoes, it is often found that the toes are the widest part of the foot. Wearing shoes with narrow, tapered toe boxes for many years cause our toes to bend inward, which has apparently become accepted as "normal" in our modern society. This often leads to bunions, but it also affects your calves, your back and the rest of your body. And it can turn running, walking or even standing into a painful experience. 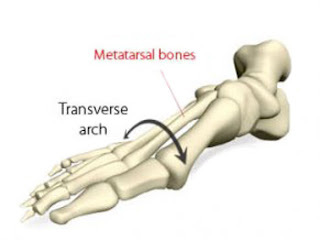 Another result of toe springs, closely related to these toe deformities, is the collapse of the metatarsal arch, or primary transverse arch. This is an arch that runs perpendicular to the length of your foot, just below the ball behind the toes. Toes stuck in an upright, bent position cause this arch to push down and collapse. The anti-orthotic orthotic. If you read much of what I write for the Soft Star blog, you'll know that I am no fan or orthotics. I see them as crutches that mask foot pain without correcting the problems that cause it, and I believe they often only make foot injuries worse (for example, my experience with plantar fasciitis and arch supports). Metatarsal pads may look like just another orthotic, but they are, in fact, designed to reverse the damage caused by toe springs and tapered toe boxes by helping reshape the metatarsal arch in the opposite direction from what conventional shoes have pushed it into. 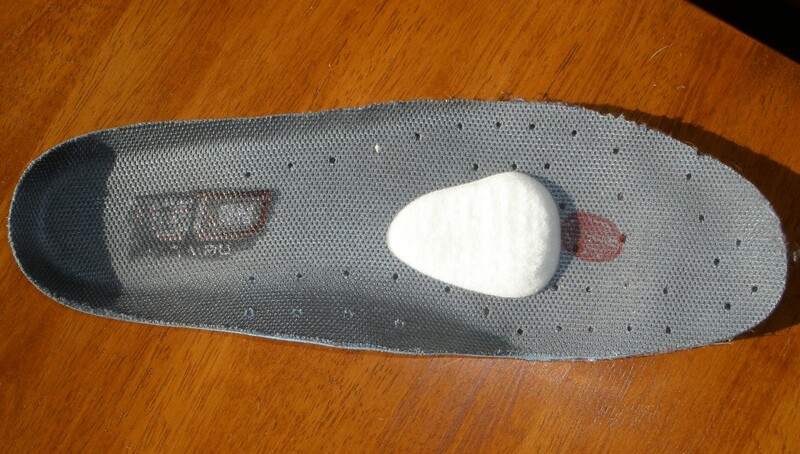 Metatarsal pad (white) on an innersole. This is Doc Ray's specialty, since he designed them and used them to restore his own natural foot function. 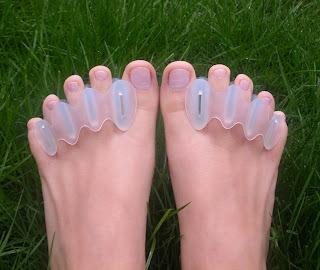 Correct Toes are silicon toe spacers that you can wear in many minimalist shoes, and they work to gradually and gently spread your toes out so that they are once again the widest part of your foot. 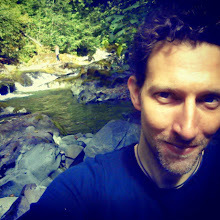 The Doc has a lot of documentation on his site for Northwest Foot and Ankle about how many foot problems these things can help resolve, as well as some surprising before and after images. When Doc Ray finished presenting his tips, Sanatan took the stage and showed us some more exercises we could do to treat and prevent injury. He started by pointing out that most running injuries happen by advancing ourselves too fast and by ignoring messages of pain that our body send us. This recaps the second rule of Minimalist Monday: run in your own footsteps. That is to say that we all come from a different place and run at our own level, so we must listen to our body and let it be our guide. If it says stop, then stop and let your body rest and heal. Sanatan recommended using a lacrosse ball as another way to help restore the metatarsal arch. He had us place the ball under that arch, just behind the ball of the foot, and asked us to imagine trying to pick up the ball with that arch. I can't imagine anyone actually succeeding in that, but the idea was clear: try to bend your foot and metatarsal arch around the ball to make the underside of your foot more concave. Another simple desk exercise. Those over-priced rolls of foam are great for nailing pain in your legs, and apparently the rest of your body. Sanatan had each of us sit with a roller just behind the ankle, then asked us to bend our toes, then move our ankle left and right, then move it front and back. If we felt pain or tightness of muscles as we did those movements, even without rolling, then it was probably a spot we needed to work on. We then did the same thing going up and down our calves. Rolling was also an option if it felt good, but I was surprised to learn that just flexing toes with a roller under your leg was often good enough. He emphasized the importance of getting the muscles to slide back and forth to promote looseness and healing. Incidentally, you can also do this with a lacrosse ball. Docs demonstrating sliding muscles on calves. Lots of bare feet in this place! There you go, lots of exercises to get your feet back to their natural state and stay injury-free! Do you have any thoughts about these techniques, or have more tips to share? If so, I'd love to hear them.